'MARCOM's "Accident Investigation" Interactive CD-ROM Course shows employees the steps that are taken in an Accident Investigation, and highlights how important it is for employees to fully cooperate with any inquiry ". "Accidents will happen". In spite of our best efforts, things occasionally do go wrong. While many accidents seem to happen for obvious reasons, there may be things that contribute to an accident which are not always apparent. That is why it is vital to conduct Accident Investigations. It also points out that while an investigation's focus is to determine the cause of an accident, the overall goal is to prevent similar accidents from happening again. Areas covered in the course include the goals of an accident investigation, securing an accident scene, "root-cause" analysis, the importance of investigative interviews, assisting in an accident investigation, the importance of warning signs in accident prevention, reporting "near misses", the role of policies, equipment and training in accident prevention, and more. Using a powerful combination of audio, full-motion video, text and colorful graphics, this course provides the most cost-effective safety and regulatory compliance training available today. The course is divided into a number of logical sections so information is easily understood... and retained. Also designed with the training manager in mind, all courses in the Interactive CD-ROM Training Library include a learning management system (at no additional cost). Using this system, trainers can set up "Pre" and "Post" tests... establish log-in procedures... even define and set up curriculum for various job classes. The system also collects and organizes employee performance information through a powerful relational database, which can generate a number of record-keeping and tracking reports... and has a database "import/export" feature, which allows information to be transferred to and from an external database (such as a company's personnel database). 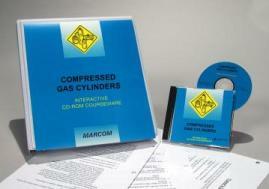 The course is one of over 100 titles currently available in the Interactive CD-ROM Training Library.